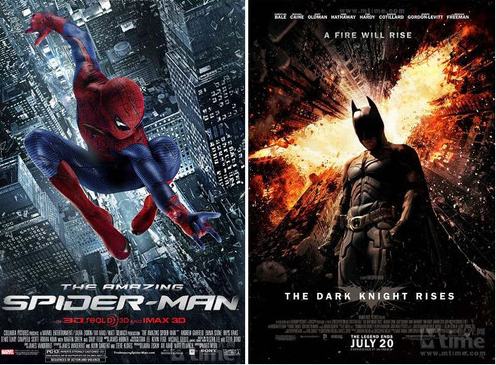 The hotly anticipated and—in Hollywood, at least—much protested head-to-head box office matchup between Sony’s The Amazing Spider-Man and Warner Bros’ The Dark Knight Rises kicked off on Sunday night in China to good, but not record-breaking, grosses. After waiting out long delays in July and August for the end of China’s “domestic film protection period” (which was publicly acknowledged for the first time last week by a senior SARFT official), the two superhero movies opened to estimated first day grosses of $5.35 million for Spider-Man and $4.4 million for Batman, according to China.org. These are good numbers for Sunday-Monday debuts, but they fell far short of the $15.9 million first day record set by Transformers: Dark of the Moon in 2011, and the $11.6 million April, 2012 debut of Titanic 3D. With the two films saturating the majority of China’s screens in wide release, including nearly all of the country’s IMAX locations, many theater managers were said to be disappointed with the results. Although I expect each picture will ultimately earn at least $50 million in Chinese ticket sales, each will likely under-index in China relative to their massive grosses in the rest of the world ($941 million so far for Dark Knight and $697 million for Spider-Man). Another key factor behind the less-than-thrilling grosses is the bunched releasing schedule that was forced upon the superhero tent-poles by SARFT’s extended summer blackout on Hollywood films. And with Prometheus opening on September 2nd and The Expendables 2 following on September 4th, the heightened competition for Chinese moviegoers’ attention may not allow for any new records until the logjam of major films is worked through later in the fall. This entry was posted in Uncategorized and tagged Amazin, Amazing Spider-Man, Christophe, Dark Knight Rises, IMAX, Sam Raimi, SARFT by chinafilmbiz. Bookmark the permalink. The release of the films also coincides with many people returning from vacation and schools and college terms starting, especially in the major cities. Not saying it is the only cause, but it has some effect for sure.